Even in February, the farmers markets in Southern California have plenty of summer greens. Plump bunches of romaine, red leaf lettuce, arugula and Italian parsley are stacked high on the farmers' tables. To create a healthy, refreshing dish, all you have to do is rinse the greens in clean water, flick dry and toss with a simple dressing. But this is winter and another group of vegetables come into their own when the sun's rays have weakened, the days are shorter, and the temperatures lower. 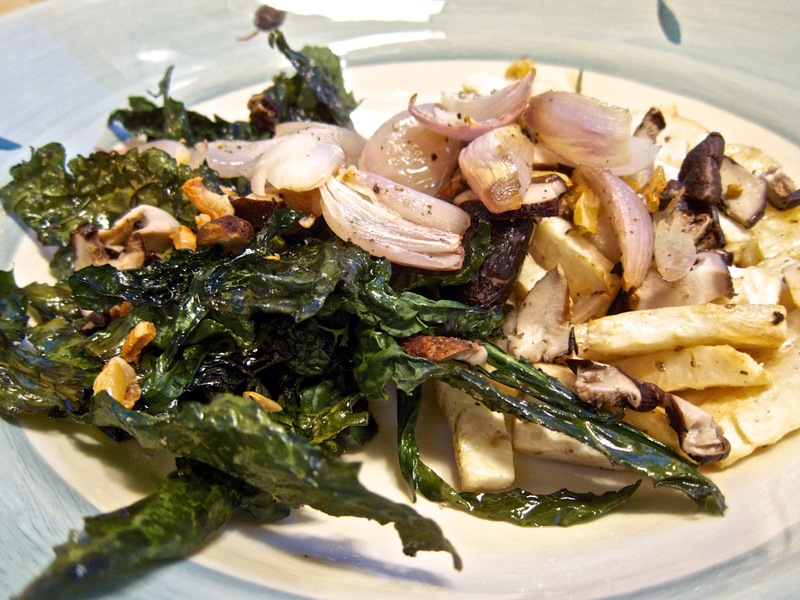 Black kale, turnips, beets and celery root are now in their prime and require only a little more effort to create a delicious salad. Using an oven's heat to bring the best out of vegetables turns starch into sugar and coaxes crispness out of leafy greens. For Zester Daily I wrote an easy-to-make recipe for a roasted vegetable salad that is delicious when the chill is in the air. A salad with a bit of warmth is a perfect accompaniment for roasted meats and seafood or a hearty braise: A Winter Pick-Me-Up: Roasted Vegetable Salad. In summers past, I grew yellow squash with great success. The plants spread to every inch of the garden, threatening to overwhelm tomato plants, the herb garden and a small patch of arugula. After the vines firmly established themselves, the long, fat squash seemed to appear overnight. What to do with all those squash? A neighbor saved the day. She loved squash blossoms. She would nip the problem in the bud, so to speak, by picking blossoms before the squash could appear. Ultimately our best solution was avoidance. We stopped planting squash. Problem solved. But I missed squash's pleasant crunch and clean flavor. 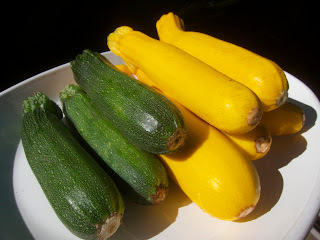 Last week we were gifted with a basket of zucchini and yellow squash from our next-door neighbor's front yard garden. Picked while they were young, before they became watery, the zucchini and squash were unblemished, firm and the picture of health. There were a great number of ways to prepare such perfect specimens. They could be steamed, grilled or even eaten raw in thin slices or grated. Because I had a beautiful bone in ribeye steak, I decided to sauté them with garlic to use as a side dish. Sautéing would caramelize and bring out their hidden sweetness. 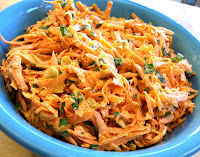 Combined with carrot rounds, the color and texture contrast would add to the pleasures of the dish. Steak never had such a pleasant companion. 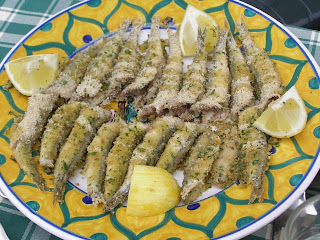 Heat a large frying or chef's plan with olive oil, seasoned with sea salt and pepper. Add onions and garlic. Sauté until lightly browned. Add yellow squash and carrots. Sauté until lightly browned. Finish with sweet butter. Taste and adjust seasoning with sea salt and pepper. Serve hot. Dust with 1/4 teaspoon cayenne for heat. 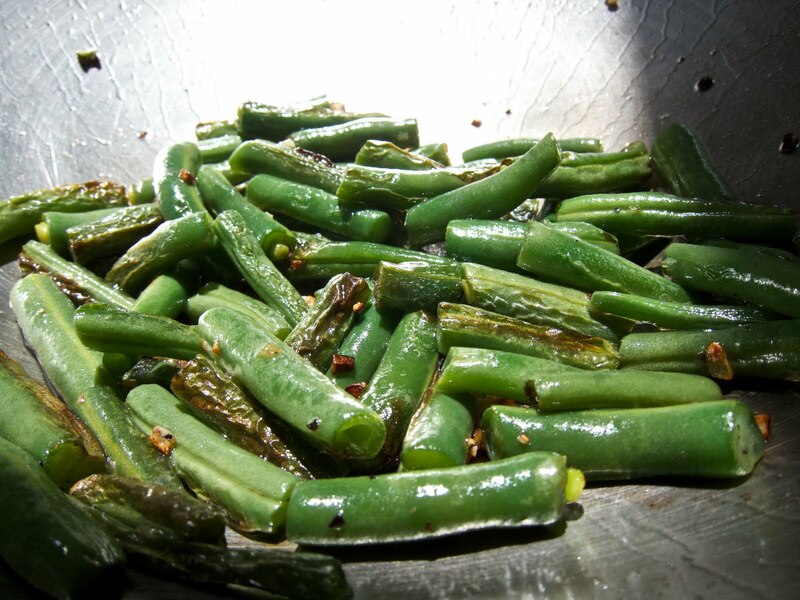 With the carrots and squash, add 1/2 cut washed, trimmed green beans, cut into 1/2" long pieces. With the onions and garlic, add 1 tablespoon washed, trimmed shiitake mushrooms, roughly chopped. Once all the vegetables are cooked, add 2 cups cooked pasta, toss, dust with freshly grated Parmesan cheese and serve as a side or main dish. Burgers, hot dogs, potato salad, cole slaw and fresh fruit salads are Memorial Day classics. I look forward to those favorites but to keep them interesting, it's good to add something new and a little unexpected. 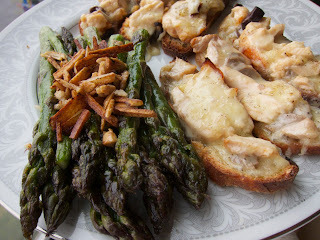 When I was growing up, asparagus was one of the fancy vegetables. 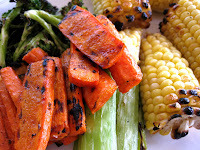 Carrots, corn and broccoli were the everyday vegetables. Asparagus was saved for special occasions. These days asparagus is affordable, easy-to-prepare and versatile. Right now asparagus is plentiful in farmers markets. Nutritious, delicious and loaded with healthy minerals, asparagus can be enjoyed raw or cooked, as a salad or a side dish to add zest to a backyard barbecue or afternoon lunch. Look for small to medium sized stalks that are firm and without blemish or shrivel-marks. Slice in half the long way the larger stalks just before serving. 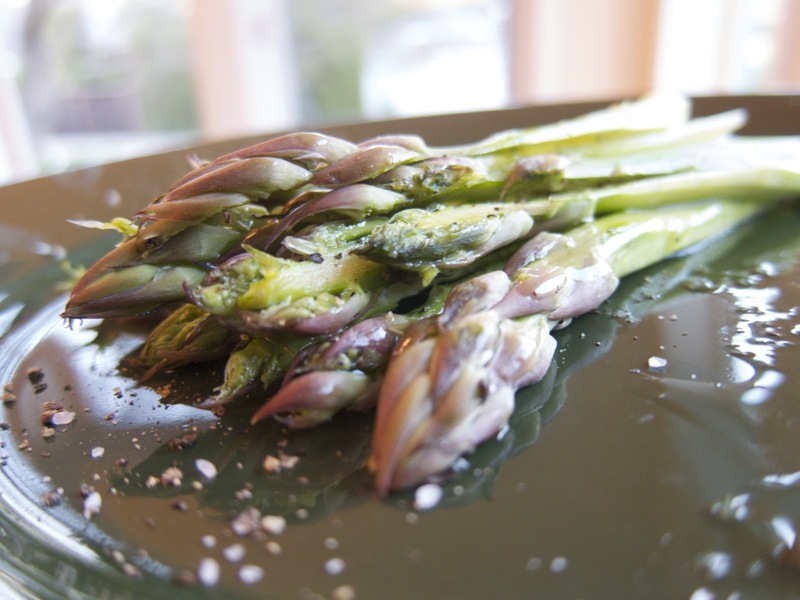 Just before serving, toss the asparagus with the seasoned olive oil. To add heat, dust with a pinch of cayenne or 1/4 teaspoon pepper flakes. Sprinkle 2 tablespoons flaky goat cheese over the asparagus. Finely chop 1 garlic clove and lightly sauté until brown, sprinkle over the asparagus. Use any size asparagus you like. Toss the asparagus in the seasoned olive oil and place on the grill. Tongs will help turn the asparagus on the grill. Be careful to brown but not burn the tender stalks. Serve warm. Grill with carrots (sliced or whole baby carrots) and serve as a vegetable course or as a side dish. To add heat, dust with a pinch of cayenne or an additional 1/4 teaspoon freshly ground black pepper. Use any size asparagus you like. 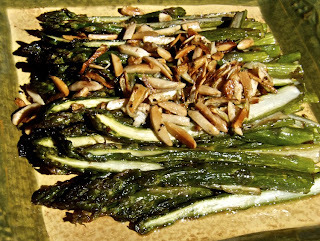 I prefer large or medium sized stalks, cut in half the long way so I can caramelize inside the asparagus. 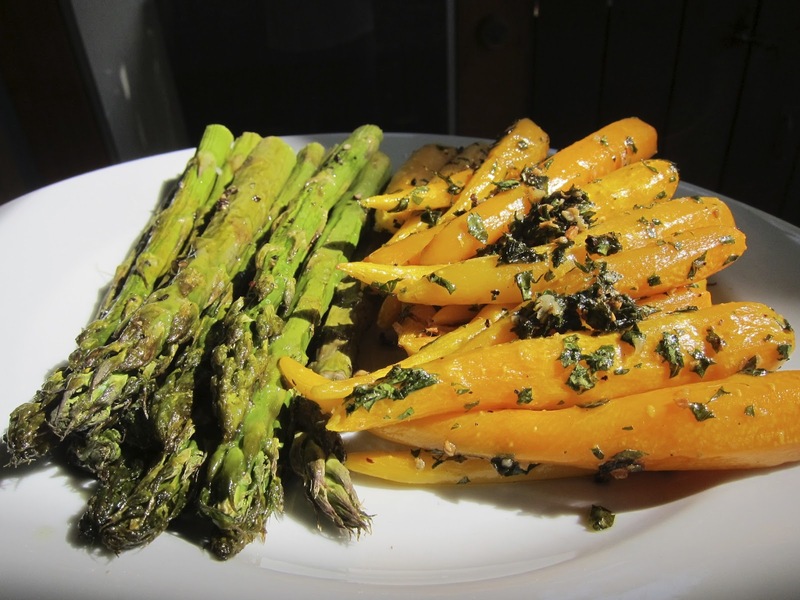 The dish is as delicious whether you steam or sauté the asparagus. The choice is yours. Blanched, raw slivered almonds are widely available in supermarkets. From my experience, Trader Joe's has good quality, affordable almonds. To deceive the eye, the shallot and garlic clove should be sliced to resemble the almond slivers. The surprising sweet-savory/soft-crunch contrast adds to the fun of the dish. Heat a large frying pan with the olive oil, seasoned with sea salt and black pepper. Add the asparagus, cooking in batches if necessary. Don't crowd them in the pan so they cook evenly. Use tongs to turn them frequently to brown and avoid burning. Remove the cooked stalks to a plate lined with a paper towel. In the same pan, cook the shallot, garlic and almonds until lightly browned. Add a touch of olive oil if needed. Season with black pepper. 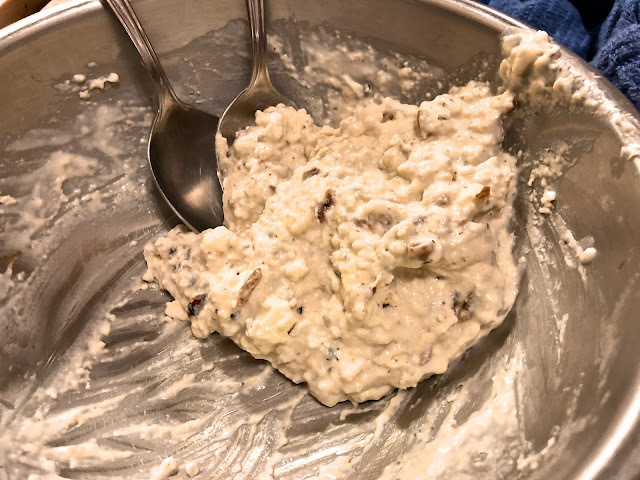 Either add the cooked asparagus back into the pan with the almond mixture and toss well or plate the asparagus and top the stalks with the almond mixture. 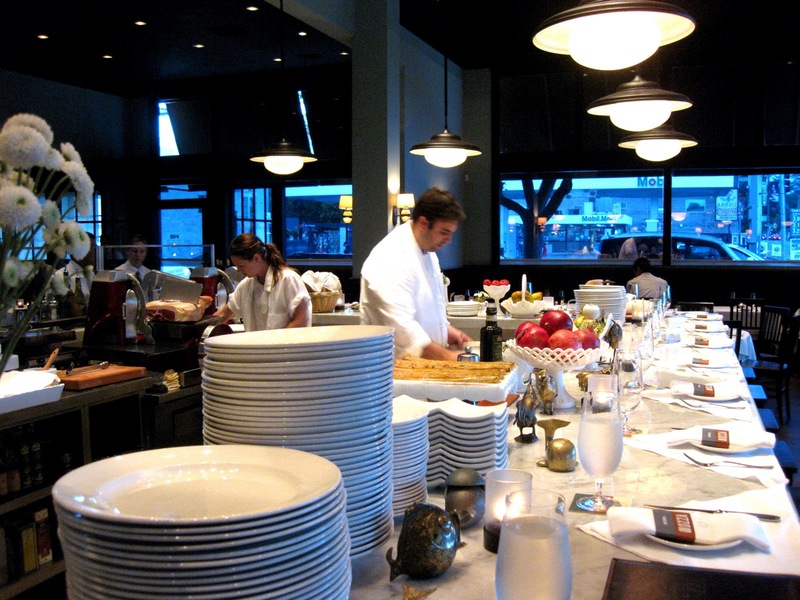 For the West Side, Michael's is a member of a small group of upscale restaurants. On the spring menu, starters are priced from $18 for a half dozen raw oysters to $22 for the Maine lobster gnocchi with mains ranging from $34 for the Jidori half-chicken to $44 for the rack of lamb and New York steak. But Happy Hour at Michael's is a bargain and it begins early (Monday-Friday 5:00pm; Saturday 6:0pm). Michael keeps Happy Hour happy until closing. With flavors inspired by the larger menu, the snacks are as varied as an crostini with duck confit or with burrata, arugula and Parmigiano-Reggiano, truffle-thyme fries, Andouille sausage with beer caramelized onions, piquillo pepper and avocado salad and an upscale riff on Roscoe's Chicken and Waffles in the Jidori wings with maple syrup and chile salt (addictive!). For Mother's Day, Michael's has a Sunday brunch from 11:30am-2:00pm. 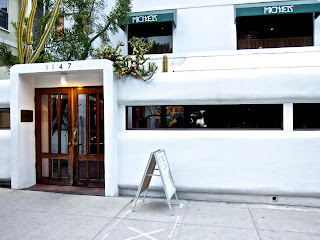 The prix fix menu for adults ($65.00/person) and for children under ten ($30.00/person) has four to five choices per course in a three course brunch. The dishes are elegant (oysters with blood orange mignonette, petit prime filet with English peas, Shimeji mushrooms and white corn) and familiar (Eggs Benedict, Cobb salad, blueberry pancakes with chicken sausage or smoked bacon). 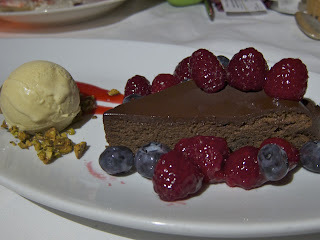 Dessert is sensible (strawberry-oatmeal crisp with creme fraiche ice cream) or complex and rich (dark chocolate cake with vanilla bean ice cream, chocolate ganache and raspberries). If you want to toast mom, Michael's has an excellent wine cellar, including wines McCarty grows and bottles at his Malibu home, and a selection of delicious cocktails (a blood orange mimosa, Stoli bloody bull, "smoke love" with single malt scotch and smoked mescal, the "dark side of the moon," a wicked mixture of gin, vermouth, orange juice, lime orange oil simple and Creme de Violette! and a "frozen white lady," a sweet, ice cold, lemony confection of a drink). Up the hill from Santa Monica, Maison Giraud (1032 Swarthmore Avenue, Pacific Palisades, CA 90272; 310/459-7561) is an outpost of French cuisine in suburban Pacific Palisades. Paired down and minimalist, the dining room is elegantly efficiently. 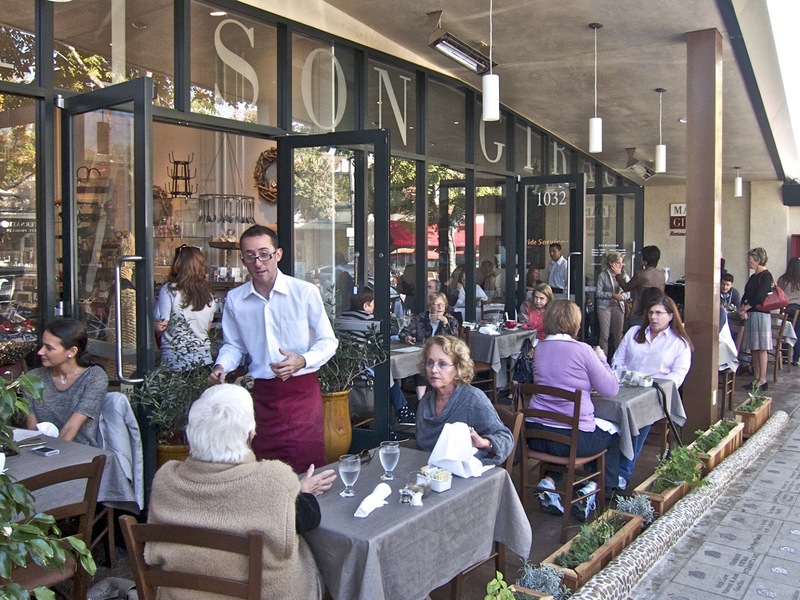 Outside on the covered patio, diners enjoy eating at sidewalk tables, shaded by trees. Alain Giraud wants the restaurant to be a relaxed gathering place for everyone wanting a good meal in a quiet setting. 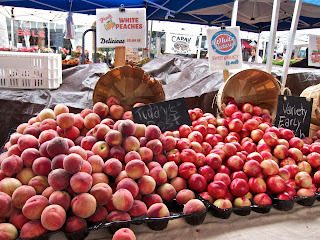 Like McCarty, Giraud is a habitué of farmers markets, looking for the freshest, best tasting, seasonal products he can find. 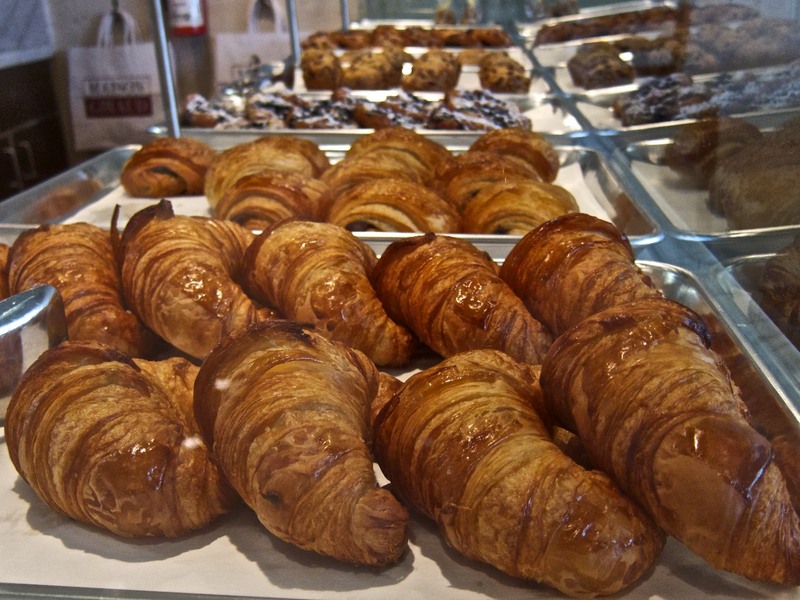 In the bakery he shows his deft hand with buttery, effervescent croissants, brioche, Danish, and other sweet and crisp pastries. For Mother's Day, Giraud will serve brunch from 10:30am-2:30pm featuring the usual menu with a selection of omelets, custardy scrambled eggs, French toast, Nicoise salad, grilled salmon, quiche and Eggs Benedict. 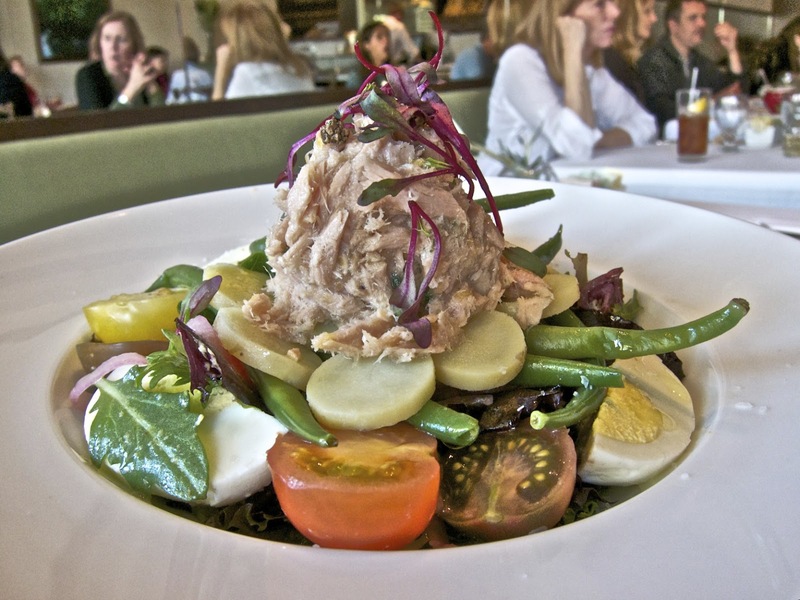 For Mother's Day, he has added a green asparagus salad with citrus vinaigrette, roasted halibut and spring vegetables and for dessert, a strawberry and pistachio confection. 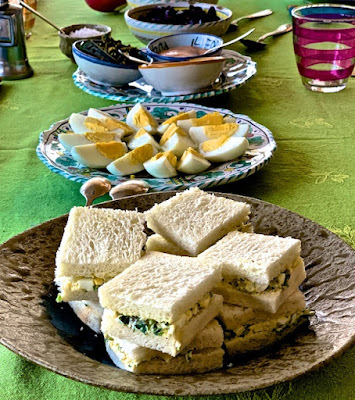 Besides dining at the restaurant, Mother's Day can also be celebrated at home by ordering from the bakery and the take-out menu. Walk through any farmers market and the bounty of summer will be on display in mounds of freshly picked carrots, beets, lettuce, broccoli, cucumbers, peppers, onions, parsley, zucchini, corn, celery, green beans, tomatoes and spinach. 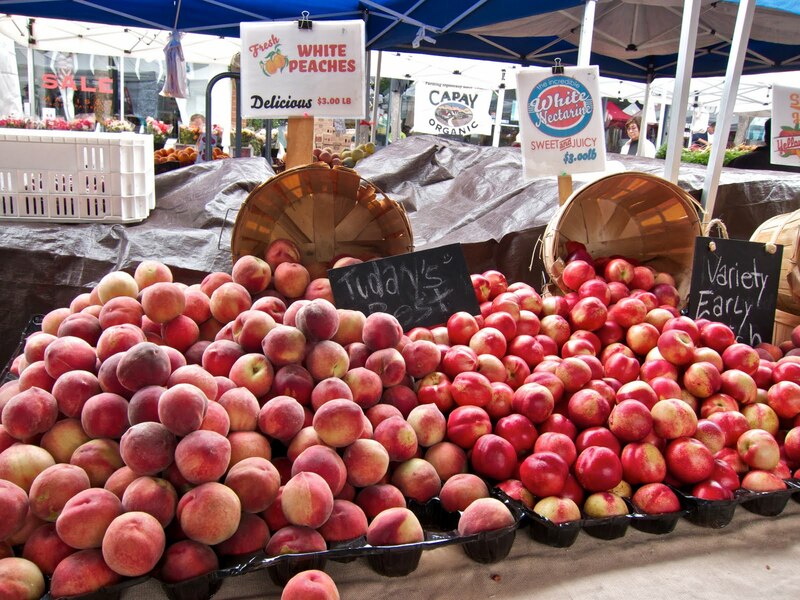 Nearby there will be baskets of fat figs ready to burst, bright pink peaches, sharply colored pluots and plums, nectarines the size of soft balls and clusters of black, green and red grapes, seedless and seeded. How great is all that wonderful food! Now, what to do with it? That's the challenge. It's hot outside, so who wants to cook? You've grilled all summer long and while you love grilled vegetables, you need to take a break. My suggestion is simple, make gnocchi. If you've never made gnocchi, you're probably saying it's too difficult to make. Only Italian chefs can do that. The truth is, gnocchi are easy to prepare. And it doesn't take much time in the kitchen. 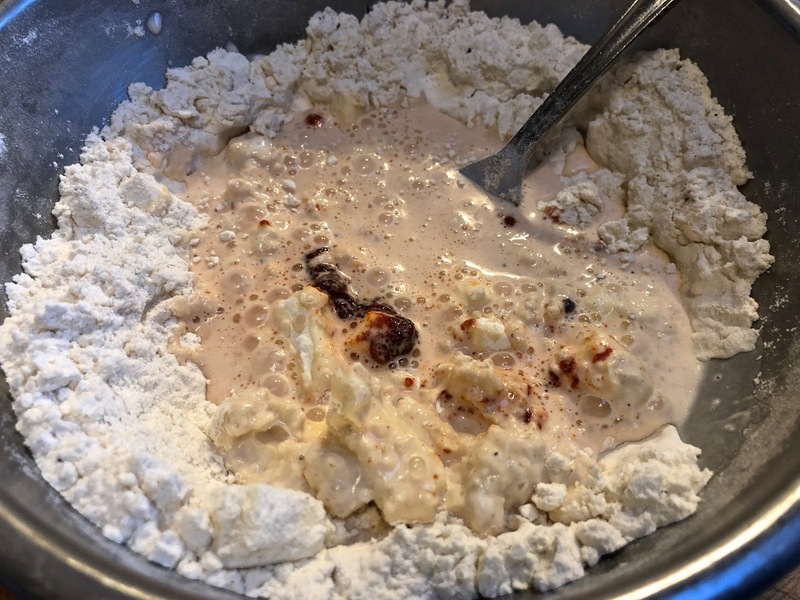 For Zesterdaily I wrote an easy-to-make recipe that lays out all the steps to making gnocchi at home. 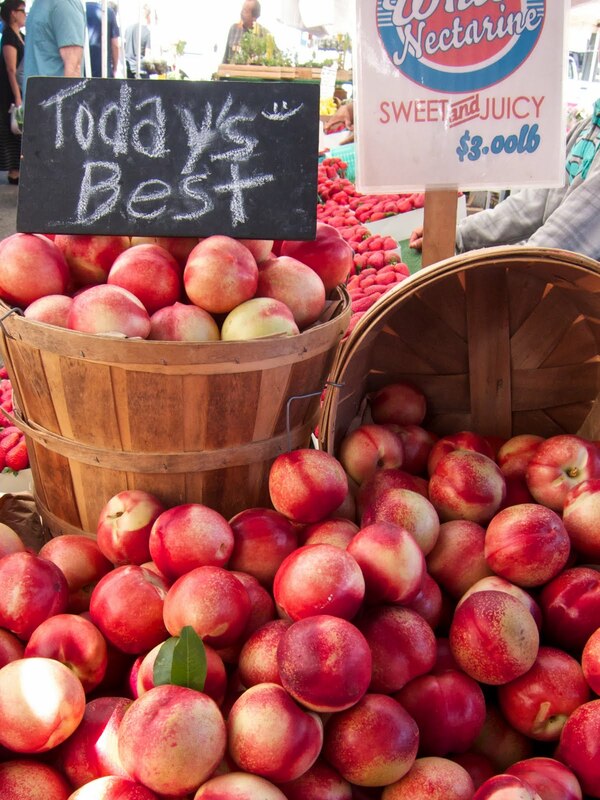 At the height of summer, the farmers markets have the most amazing selection of fresh fruits and vegetables. Corn, tomatoes, carrots, beets, eggplant, zucchini, peas, broccoli, parsley, arugula, frisee, plums, pluots, figs, peaches, nectarines, apples, grapes...I'm running out of breath trying to say them all. Part of me wants to spend the whole day in the kitchen experimenting and playing with all these great ingredients. The other part would prefer to stay outside, enjoying our beautiful Southern California weather. This recipe splits the difference. I can have fun with the farmers market bounty and it takes only 30 minutes. That's a win-win if ever there was one. For vegetarians, this is a very satisfying meal-in-one. For everyone else, cooked meat, poultry and seafood can easily be added with great results. 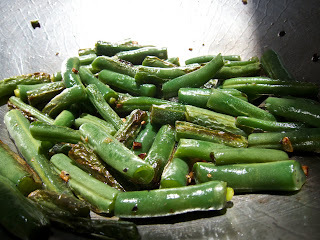 I choose to cut all the vegetables so they are similar in size to the corn kernels, although I make an exception for the string beans, which I think are more enjoyable when cooked in lengths of at least 1". A personal preference. At any rate, cut the vegetables small or roughly, depending on how you like them. Bring to a boil a gallon of water with the kosher salt. Add the pasta and stir well initially and every couple of minutes to prevent sticking. Cook until al dente, about 10 minutes. Place a heatproof cup in the sink and capture one cup pasta water when you drain the pasta. Return the cooked pasta to the pot. 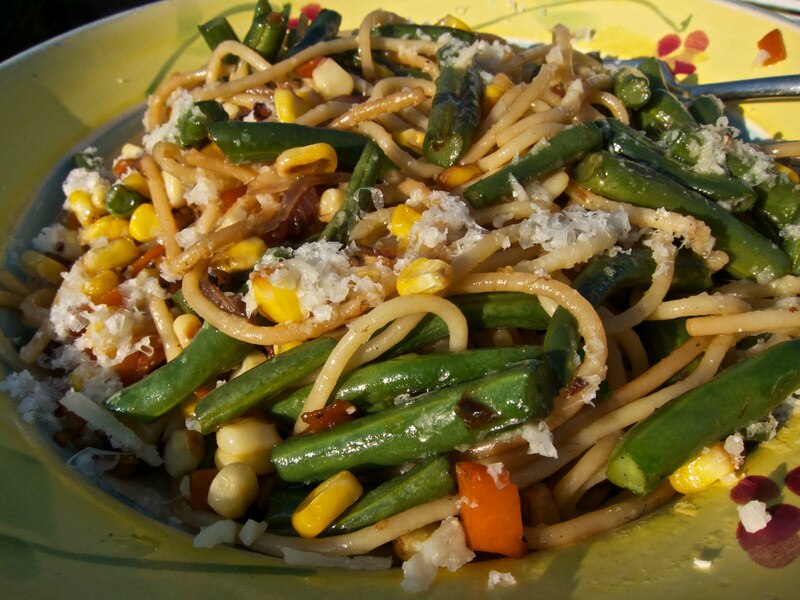 Toss the pasta with 1 tablespoon each of olive oil and sweet butter. Season with sea salt and pepper. Lightly cover--do not seal--with a sheet of aluminum foil to keep warm. In a large frying or chefs pan, heat 1 tablespoon olive oil. Sauté all the vegetables until brown. Add 1 tablespoon sweet butter and 1/2 cup pasta water. Simmer over a medium flame until the liquid is reduced by half. Add the cooked pasta. Toss well to coat. If more liquid is needed, add more of the remaining pasta water and a pat of butter. Taste and adjust seasoning with sea salt and pepper. Serve with freshly grated Parmesan or Romano cheese. Instead of Italian parsley, add 1 tablespoon fresh oregano. For heat, add 1/4 teaspoon cayenne to the vegetable sauté. Along with the pasta water and sweet butter, add 2 cups of any chopped, cooked meat, poultry or seafood you like. Add roasted, skinless, chopped tomatoes with the pasta water and sweet butter. Add 1 cup raw, chopped tomatoes with the vegetables. Along with the freshly grated cheese, add 1/4 cup toasted pine nuts or roughly chopped almonds. Along with the freshly grated cheese, add 1/4 cup toasted or sautéed bread crumbs. The obvious reason why we eat outside our homes is we are hungry and want someone else to do the work of cooking and cleaning up afterwards. But there other reasons, ones that will enrich our lives back in our own kitchens. For Zesterdaily, I wrote about a memorable meal at a restaurant that led to one of my favorite meals at home. 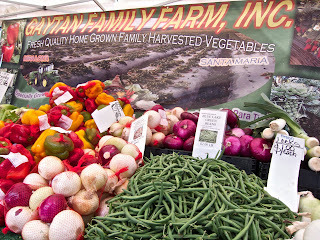 Nothing is more satisfying than farmers' market fresh vegetables. 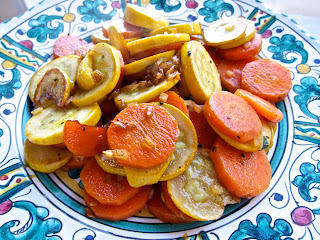 Usually I'm completely happy relying on olive oil, sea salt, and pepper when I saute, grill, or roast the great bounty of summer vegetables. Do carrots, broccoli, asparagus, fennel, peas, string beans, tomatoes, squash, and potatoes really need elaborate sauces to bring out their flavors? The Italians get it right, in my opinion. Buy the best ingredients and get out of the way. And yet, there are times when a little more spice or a variety of flavors is needed to reinvigorate the palate. A few drops of fresh citrus juice, a dusting of cayenne, a sprig of fresh rosemary, or a drizzle of nam pla can transform the familiar into the exciting. Authentic Indian curries are complex combinations of a dozen spices and herbs. An easy-to-make version for every day use can be made with a packaged curry powder or pulled together with five basic elements: fresh garlic, turmeric, cumin, coriander, and coconut milk. Keep the curry vegetarian if you want or add poultry, seafood, or meat. The choice is yours. Since my wife doesn't eat poultry or meat, but I do, I start with vegetables and spices to build the flavors, make her portion, then add meat for mine. That way we're both happy. The best part is that an affordable and delicious meal can be prepared in 30 minutes or less. Use whatever fresh vegetables you enjoy. For stock, homemade is best, as much for flavor as for avoiding excess salt. 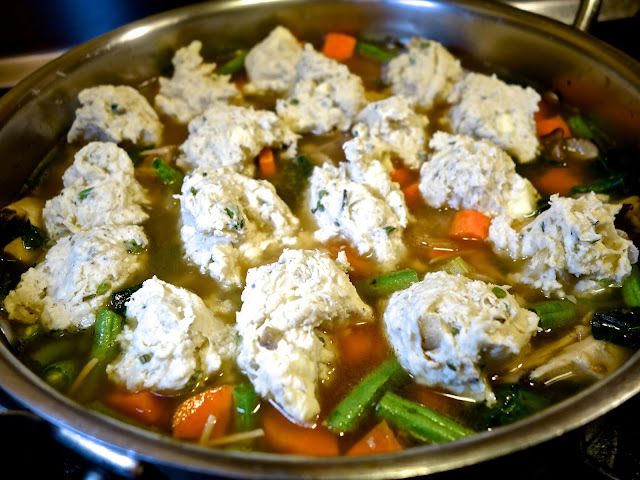 It's easy enough to make chicken or vegetable stock and freeze it. 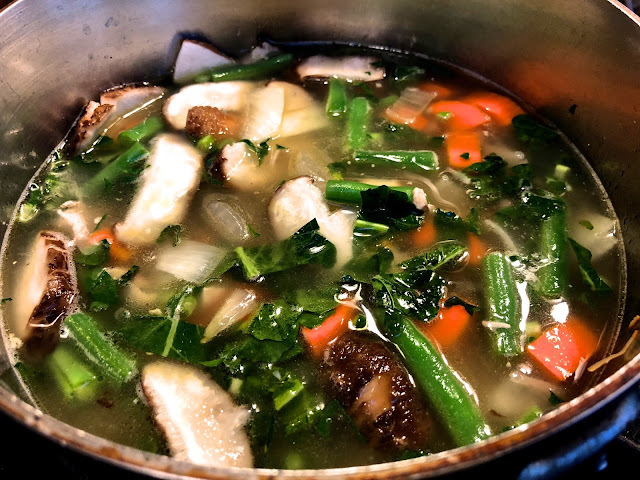 A side note: with the vegetable peelings, make a stock by putting them into a pot with 4 cups water, simmer 30 minutes, run through a food mill, and collect the liquid and solids to use for the curry or freeze to use when needed. Find an organic coconut milk that doesn't use chemical preservatives. Freeze what you don't use for later use. 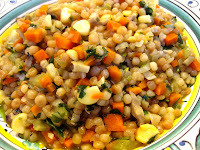 In a large saucepan, heat 1 tablespoon of olive oil and saute the vegetables until lightly browned. Remove. Add the other tablespoon of olive oil and saute the garlic and spices until lightly browned. Return the vegetables to the pan and toss well. Pour in the liquid (water or stock) and coconut milk. Stir well to deglaze the pan and combine the flavors. Simmer on a medium-high heat for 15 minutes. Taste and adjust seasoning with sea salt and pepper. Serve with rice, pasta, or steamed spinach. Including meat in the dish adds only 5 minutes to the preparation time. Leftover meat can also be put to good use here. In a large saucepan, heat 1 tablespoon of olive oil and saute the sausage and chicken until lightly browned. Remove. In the same pan saute the vegetables until lightly browned. Remove. Add the other tablespoon of olive oil and saute the garlic and spices until lightly browned. Return the meat and vegetables to the pan and toss well. Now that corn has reappeared in the farmers' markets, it's time to grill, baby, grill. 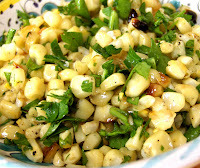 Boiled corn slathered with sweet butter and seasoned with sea salt and pepper is delicious. So too is grilled corn where olive oil replaces butter. Lightly browned, the kernels caramelize, adding sweetness and the hint of smoke. Make extra, so the kernels can be removed and used in green salads, salsas, and--my favorite--pastas. Tuscan or black kale is widely available in the farmers' markets in large, inexpensive bunches. Adding in mushrooms, onions, garlic, a pat of butter and you're ready to enjoy a delicious lunch or dinner that needs little more than a simple romaine or arugula salad, a glass of wine or an ice cold beer, and you'll have a memorable meal with no more effort and time than it would take to order take out. If a grill is not available, preheat the oven to 350 degrees. Pour the olive oil on a flat plate. Season with sea salt and pepper. Roll the corn through the seasoned oil to coat. Put on the grill or into the oven, turning every 5 minutes to prevent burning. Do the same with the Italian sausage. Roll in the seasoned olive oil and grill or roast. For vegetarians, don't bother with the sausage. While the corn and sausage are cooking, put a large pot of water on a high flame, seasoned with 2 tablespoons of kosher or sea salt. Don't use ordinary table salt which has a metallic flavor. While the pasta water is heating, saute the onions, garlic, mushrooms, and kale until softened. If you want the kale more pliable, add 1/4 cup of water and braise for 5 minutes on a medium-high flame. Put the pasta into the boiling water and stir every couple of minutes to prevent sticking. Use the whole box if you want more pasta. 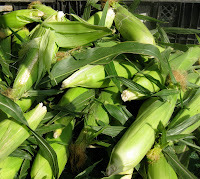 Cut the kernels off the corn and discard the cobs. Finely chop or cut into rounds the Italian sausage. Add to the kale, together with the sweet butter. Toss well. Taste the pasta. Drain and reserve 1 cup of pasta water. Put the pasta back in the still warm pot, drizzle with olive oil and season with sea salt and pepper. Toss well. Set aside. Add 1/4 cup of the pasta water to the vegetables and sausage. Stir well and taste. Adjust seasoning as desired. If more sauce is desired, add a little more of the pasta water. Pour the cooked pasta into the saute, toss well, adding another 1/4 cup of pasta water. Serve in a large bowl, accompanied with freshly grated cheese. 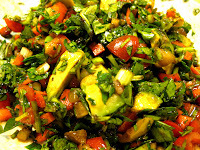 Grill or roast a red pepper, discard the seeds and skin, finely chop, add 1/4 cup to the saute. Add 2 tablespoons chopped, pitted green olives to the saute. I met Ashley and Jason Bartner on line. We connected through our love of cooking, good food, and travel. I read about their new life in Italy and I am very jealous. 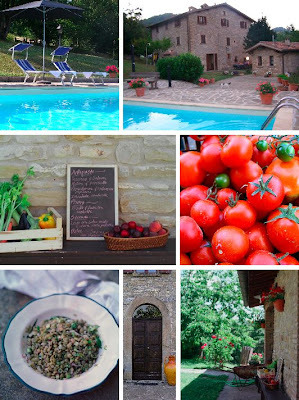 Not that I want to trade places--I love our life in Pacific Palisades--but I would definitely enjoy a long weekend or even a month staying at their farm house in Piobbico in the Marche region, just below Emilia-Romagna and east of Umbria on the Adriatic Sea. They were generous enough to send me a description of their life and a few recipes which I can't wait to try. fyi: A "glug" is roughly 1 tablespoon. After years of travel and eating our way through every city, state and country we visited, we decided to share our love for food with others in an unique way in the Marches, Italy and opened La Tavola Marche Agriturismo & Cooking School. 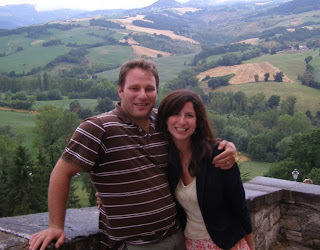 We took a leap of faith and traded in the hustle bustle of life in NYC to slow down in every aspect of our lives & started growing our own food in the Italian countryside! Jason is a professional Executive Chef & I am a customer service/hostess extraordinaire and currently write a monthly column for Italia! Magazine. 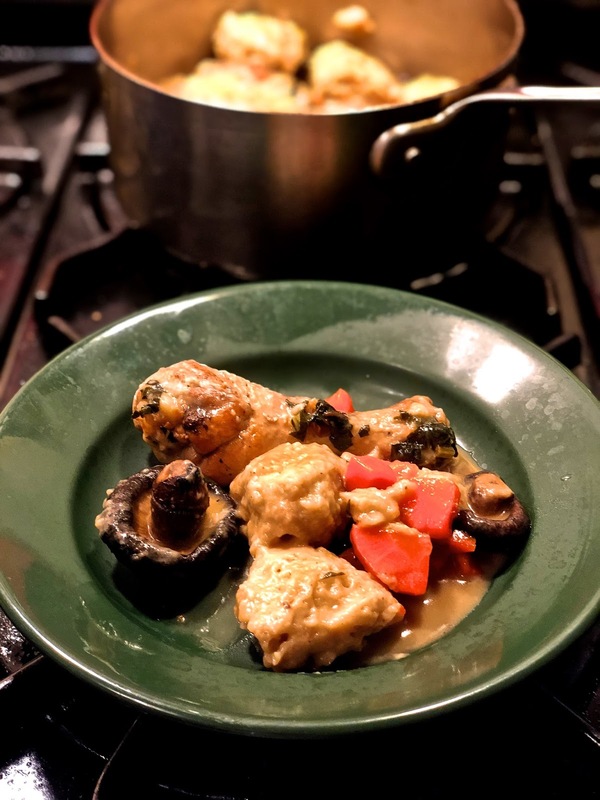 During our travels to Italy, we felt at home & really enjoyed the diversity of recipes in each region combined with the atmosphere of staying on a working farm or agriturismo - plus the Italians & their passion for life & good food!! Slow Food & slow living is huge for us! 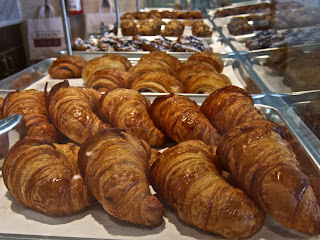 Here we live it everyday- we have slowed down in all aspects of our food & life here in Italy! For us, Slow Food philosophy translates to celebrating traditional Italian country living by eating locally & seasonally and becoming s self-sufficient as possible. This is a complete shift in our 'previous life' in the States. We are so lucky that our neighbors & friends have taught us the ropes: from age-old family recipes to plucking chickens! It's all new to us and if we can do it - so can you! In the winter Jason makes sausages & salami by hand & hangs them to dry in the rafters of the house and in the summer months, since I can't cook, I contribute by creating home made liquors! It is such a kick to create these homemade treats! We jar, jam & preserve fruits & veggies in the summer extending their season -we even make our own homemade liquors! The most full-filling aspect is that we grow our own fruits & vegetables - from apple, cherry & plum trees surrounding the house to our enormous farm garden with over 600 onions, 400 tomato plants, loads of lettuces, spinach, garlic, cucumber, pepper, eggplant, melons, zucchini, pumpkins, radishes & more!! Wild game, mushrooms & truffles as well as strawberries, blackberries, asparagus, wild dandelion greens & much more are collected from the woods behind our house! We are really excited because this spring we are adding CHICKENS! And this coming from two city kids! Our neighbors are in awe by "young Americans" with the most beautiful garden! Locals stop by to eye the goods & leave with an armful of gifts from the garden!! The most incredible part for us is being accepted into the small farming community of Piobbicowhere we live, making a world of difference in our their experiences. As always in Italy, the conversations turn to food as neighbors pop in to say hello & see what's cooking! At first the thought of an American Chef cooking traditional local dishes did not blow over well - they figured all he could do was hamburgers & hot dogs! But that has all changed! Now Jason is thought of as kin in the kitchen - grandma's are always sharing their secret recipes and he is trusted with cooking for big holidays & family events - for Italians! As testament - opening day of hunting season was celebrated at our farmhouse with a feast of wild game with a huge group of hungry local hunters! We just love sharing this experience/connection to food with our guests - we specialize in Cucina povera (peasant cooking) with farm to the table cooking classes. 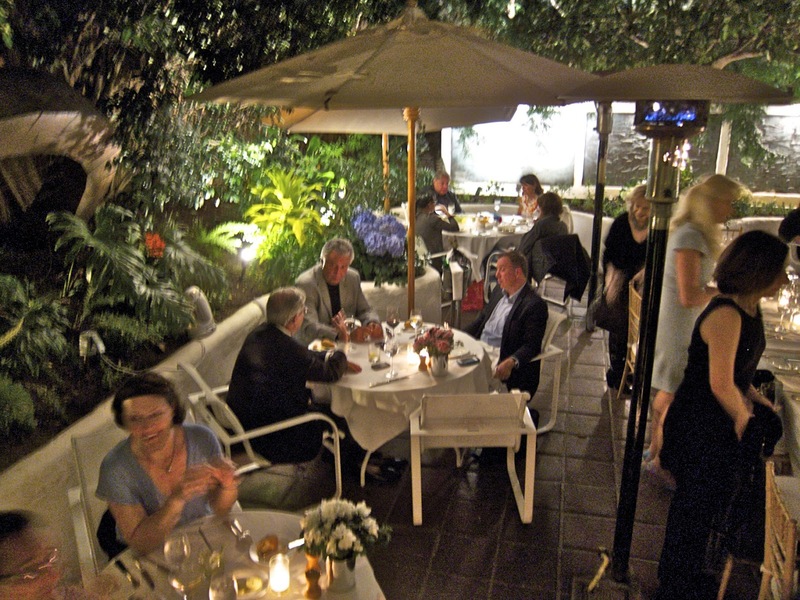 Each cooking class starts with a walk through the garden to collect the night’s dinner. 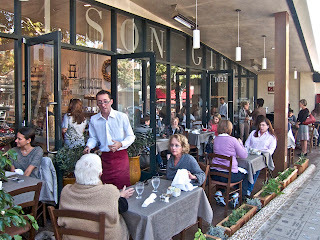 Jason is so very proud of what he has created & loves sharing that with our guests - and it seems to be contagious! Many guests return home with a longing to eat locally, start a garden, join a CSA & all around become more connected with the food they are eating & understanding where it comes from! 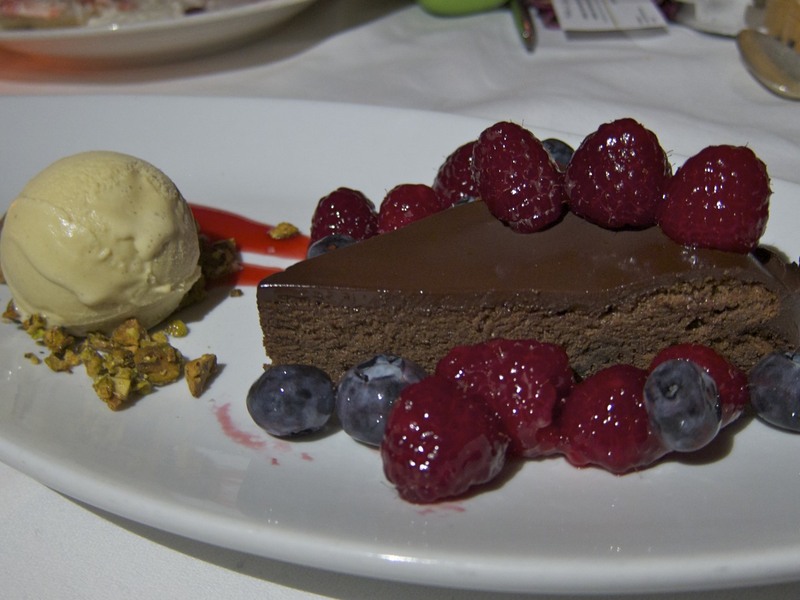 Here you will eat what your fed, there is no menu options & the guests love it! This gives us the freedom to work with what is at the height of the season & best looking at the market each day. Guests are surprised by every dish, with whispers of 'what's to come next...' Jason enjoys the time he spends at each table explaining the dish, it's history & ingredients or where the meat is from. It helps connect them to the food they are about to eat. "We hope our guests take home a taste of la dolce vita, the simplicity of good cooking, great stories to share, and an appetite to return." 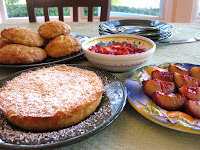 I wanted to share 2 recipes that are easy to recreate, tasty and represent our area in the winter. Heat the olive oil in a skillet. Add the carrot, onion and celery and cook over low heat, stirring occasionally, for 5 minutes. Dip the chicken livers into the vinegar, pat dry with paper towels and add to skilled. Pour in the wine and season with salt & pepper. Cook, stirring frequently, until browned. 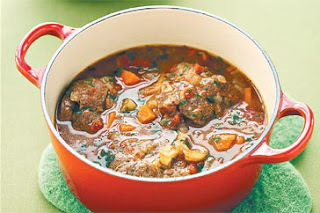 Remove the chicken livers from the skillet and chop finely, then return them to the skillet and cook for 2 minutes more. Beat together the egg yolks and lemon juice in a bowl. Remove the skillet from the heat and stir in the egg yolk mixture. Spread on slices of lightly toasted bread. Serve immediately. Salt & pepper the osso buco & then dredge in the flour. 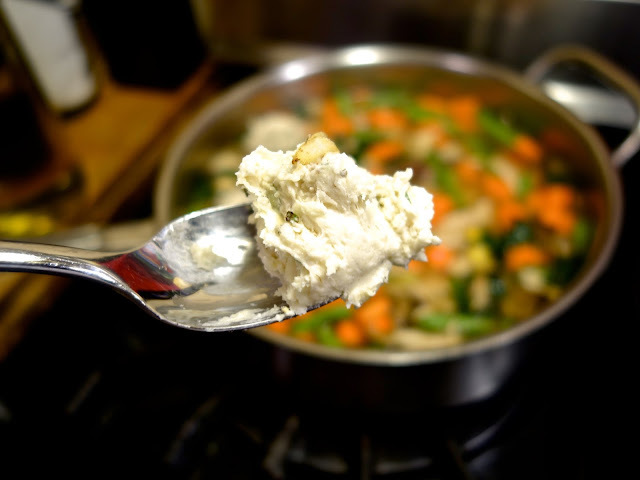 In a good size casserole or roasting pan, on med-high heat, add a glug or 2 of olive oil & a pad of butter. Sauté the osso buco for 2 minutes on each side. 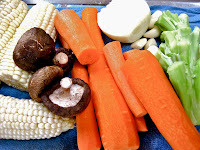 Then add the vegetables & continue cooking the osso buco, turning frequently until it is nice & colored. Add the white wine cook until the wine is reduced by 2/3. Add the tomatoes, aromatics, crack of pepper & salt, water or stock & bring up to a simmer. 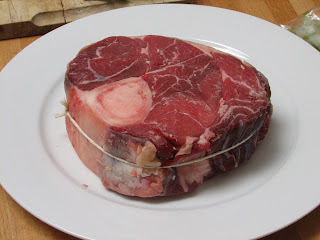 Remove from stove & place in a 350 degree oven, uncovered for about an hour & half or until the centers of the bone have melted away & the meat is falling away from the bone. If you need to add a little more water or stock towards the end, do so. Serve over polenta, potatoes or rice to soak up the juices. Judging by the night time chill, it's still winter, Southern California style. But a walk through the local farmers' markets (the Wednesday Santa Monica and Sunday Pacific Palisades Farmers' Markets) and you'd think it was summertime. Just about everything you could want is in the market, with the exception of fresh corn and pluots. 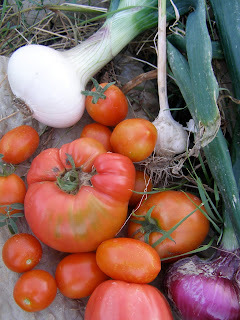 One of my favorite recipes, and one of the easiest, uses early spring tomatoes to good advantage. Eaten raw, they aren't desirable, but roasted, they're delicious. Some farmers mark down their mottled and misshapen tomatoes so price is an added bonus. Use the roasted tomato slices as a side dish with grilled chicken breasts, meat, and seafood or in a salad of alternating slices of tomato and mozzarella, a variation on a classic Italian summer dish. e stem on top of the tomatoes, cut into 1/2" thick slices, lay on a Silpat sheet or a piece of aluminum foil on a baking tray, top with a sprinkling of parsley-garlic mix, drizzle with olive oil, and season with sea salt and freshly ground black pepper. Roast 30 minutes or until the tomatoes give off their liquid and the topping is lightly browned. Remove from the oven to cool on a baking rack. Use a rubber spatula to reserve the liquid on the baking tray. Before serving, top with a sprinkling of freshly grated Parmesan cheese. Pour the roasting liquid, a mix of seasoned olive oil and tomato essence, onto the plate, then lay the tomato slices on top. Arrange the slices on top of filets of fish, such as sole, halibut, or swordfish. Keep this recipe for the summer when tomatoes improve in quality and come down even more in price. The technique is a winner any time of the year. Preheat the oven to 400 degrees. Remove the end of the stem at the top of the tomato. 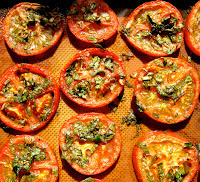 Place all the tomatoes on a Silpat sheet or a piece of aluminum foil on a shallow roasting pan. 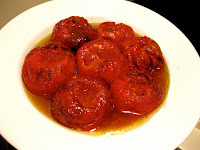 Drizzle each tomato with olive oil and season with sea salt and black pepper. Roast 90 minutes. When you remove the tomatoes from the oven you'll notice the accumulation of a clear liquid. A small portion of that is the seasoned olive oil. But mostly the liquid is given off by the tomato itself. That liquid or, let's be bold and call it "nectar", is pure essence-of-tomato. Save every drop. 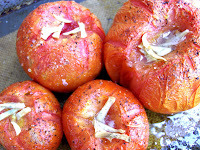 At this point the tomatoes can be served whole as a side dish with grilled or roasted meats. They can also be peeled and chopped for a pasta or a braised meat dish like short ribs. Run them through a food mill and you have the beginnings of a delicious tomato sauce. If you don't use all the tomatoes right away, they can be placed in an air-tight container and frozen for several months without damaging their flavor. A final tip about tomato nectar. If you like mozzarella with tomatoes but this time of year the fresh tomatoes don't have enough flavor, drizzle the tomato nectar, slightly warmed, over slices of mozzarella. You're in for a treat. For those who think that going without meat, sugars, and processed foods means a bland, boring diet, think again. Buying local, seasonal, fresh produce and paying attention to what you eat pays off with big dividends. The truth is, you'll save money and feel better. What's more, you won't be giving up convenience. Most of these dishes can be made in 30 minutes or less.